With the start of Food Sheriff, the most common question I'm being asked is "what are you going to do?" My answer, though unintentionally evasive, is typically "everything"! I don't think enough of us stop to appreciate what we have. This period of transition into my new company has been great for me in that I have been able to to appreciate all that I have done while Brand Manager at the Loveless Cafe. I have been working with the Loveless for almost 10 years and have been so fortunate to do so much. I will always be grateful for the opportunity but can't wait to get out there and do more. Well, thanks to Enchanted Brides Magazine, my first official Food Sheriff project was completed this week. I have been invited to be a regular contributor, producing articles, blog posts and videos for the magazine (both Middle Tennessee and Miami publications), website and social media. It seemed only fitting to celebrate with a toast. They brought in a professional photographer (these images are from my iphone) and will be publishing the piece in their Spring issue. View it online here. 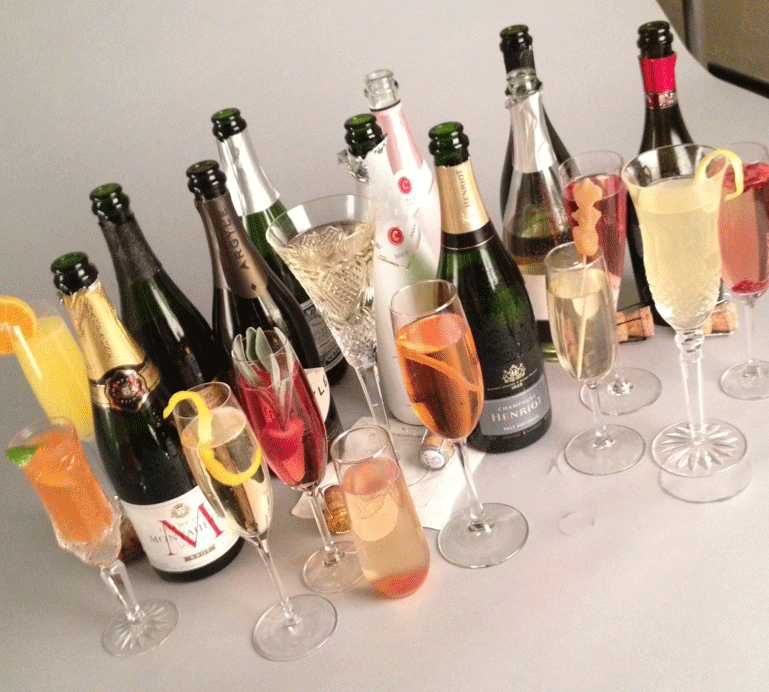 I chose to set up the shoot with a simple sweep and stage every shot with the 'trash' from each bottle. 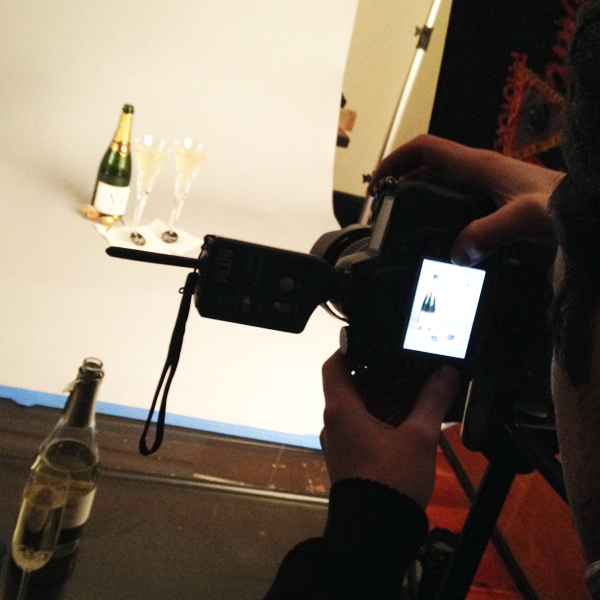 A little spritz of water on the bottles and glasses helped bring the images to life. Although the piece was really for brides, I know there's a whole group out there that love sparkling wine as much as I do. One of the things we see so often at events is a "signature" or "specialty" cocktail. Well folks, there's no beverage more signature and specialty than a great glass of champagne. But if you really want to dress it up, maybe some of the suggestions in the Enchanted Brides piece will be for your liking. Why mess with a classic? Pair a great champagne with beautiful cut crystal flutes for a toast without compare. I love San Pelligrino sodas in virtually any cocktail. Adding them to a glass of bubbly is a nice way to dilute the booze factor and stretch the dollar. The fragrance of the sage and sweetness of the fresh juicy strawberry dress up this glass of sparkling rosé nicely. Although this image is of a black currant syrup, I am IN LOVE with the Peach Basil Nectar from Bang Candy Company. Take my word for it...it's amazing in a glass of sparkling. So, when I made that batch of tangerine cello (recipe post coming soon), I had to find good uses for the fruit itself. This one definitely passes the test. The little jewels of pomegranate seeds playfully float up and down in the bubbles. Festive to say the least. Anyone that knows me knows that I am sucker for great packaging. I will admit that may have been the reason that I first tried Canton years ago, but it's one of my favorite secret slips for sips. Years ago my friends Wendy and Nate got married and offered this at their reception. I've loved it ever since. The aromatics of the rosemary are such a nice touch. If you have not yet tried this combo, you have been warned. It's a little sweet but oh-so-addictive! Though I made this one with a prosecco, the same remains true...it's frigging delicious. I recently made a batch of homemade tangerine cello (blog post coming soon) that I can't wait to try in some champagne. I love rosé wines and especially sparkling rosés. The also seem to pair amazingly with all types of food. I am obsessed with this cocktail. It's just enough bitter to really get the appetite going. So, here's a toast to 2014. To new adventures and good times. To appreciating what you have and being graciously grateful for all of life's abundances. Thank you, Gipsy and Tony from Enchanted Brides for inviting me to contribute. I look forward to doing more!